I am featuring a bikini and dress with the same print and I promise this is the last bikini on the blog this summer! The Marin is a cute nautical/pirate themed print and it is a very welcomed addition to my wardrobe. I was sent a size small top and size xs small bottoms for this review and I could have worn an xs top, though I still manage fine with the small. I have been curious about Hell Bunny swimwear in regards to the fit, style and quality and I can gladly say that it has my tick of approval. I would definitely suggest sticking with your regular Hell Bunny size but it is safe to size up if you are between sizes or if you are lucky to try it in store that is even better. This is such a cute bikini which is great quality too and this particular style has such a great subtle nautical look to it. I am sad that it will be soon be left to sit in my swim drawer until next summer! 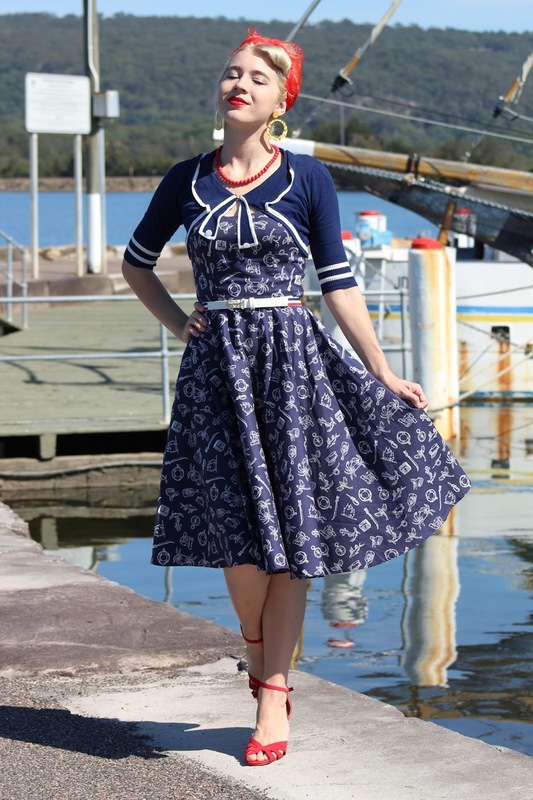 I will never end my search for perfect nautical dresses to add to my collection and the Hell Bunny Marin dress is a great addition! I only have one other dress that ties up at the shoulders and that is what first gained my attention when I first saw this one, it's creates such a cute look and it handy for adjusting the fit. The fabric didn't crinkle much when I was out today and the weather was so hot (my bolero quickly came off), it is such a a great lightweight dress for hot weather and it also has pockets, another important feature. The low back is also really nice for keeping cool. I am wearing my usual size xs and it fits as well as all of my other Hell Bunny dresses. I absolutely love this new Hell Bunny style and can't wait to wear it again next summer. 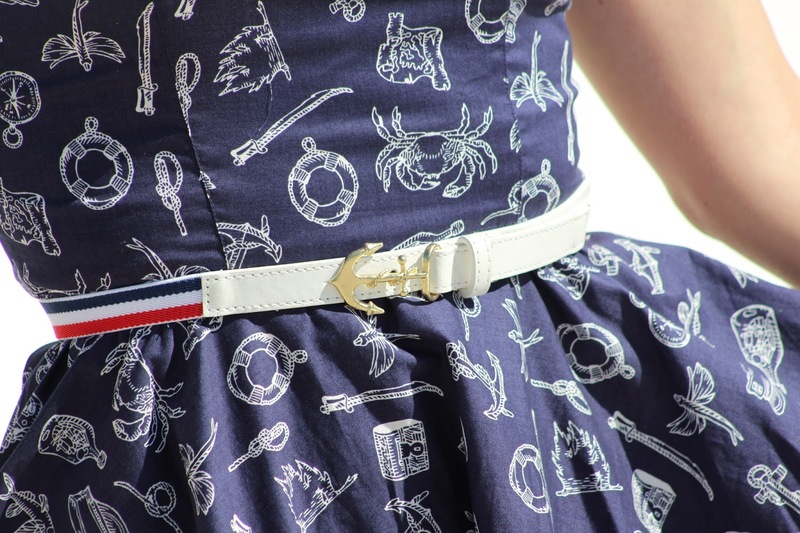 And the belt, ah the Nautical Belt by Hell Bunny is so perfect and I have been thinking for quite some time that I would love a nautical belt and it's the perfect match with this dress - though I plan to wear it with many other things! I am wearing size small and it has lots of adjustment holes and the belt has elastic too so it can fit a range of sizes. I love this swimsuit and dress. I saw skirt before. I m so looking forward to summer, even I will see the seaside just in November. Wow what a gorgeous blog post! I love both looks! Nautical gets me every time, this is just fab, particularly having a matching dress and bikini - so chic! I am always admiring the Novo shoes, it's not a brand I'm familiar with, I guess it's an Australian brand? I can't wait to break out my nautical maxi dress, I am keeping fingers crossed for the weather improving! I absolutely love Hell Bunny! You look so fabulous. I love vintage inspired swimsuits. And I'm loving that dress with all of the accessories that you added! Your nautical fashion game is always so on point! I'm a huge Hell Bunny fan, too. Their offerings fit me better than any other repro/vintage inspired brand I've ever tried. That is such a fun and great thing to have a bathing suit that matches a dress! Summer perfection!!!! Also, I really love that dress on you! The tie shoulder straps are so cute and I love everything you did with styling it. That belt is so amazing and perfect for you too! This whole outfit will have to become one of your wardrobe staples! It looks amazing on you!